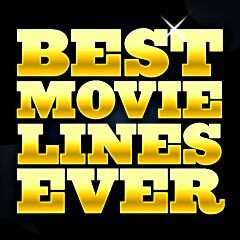 Top 10 Best Movie Lines Ever: These are the top 10 best movie lines ever, the ranked winners in a survey taken by Odeon Cinemas in the UK. You've probably heard many of these memorable lines that have lingered long after the film has played. Most of them, ironically, are parting shots within each film. See also the Top 10 Most Famous Movie Quotes according to the Guinness Book of Film, the Top 10 Best Comedy Lines From Classic Films according to TCM, and the Top 10 Greatest American Movie Quotes, according to AFI. 2. "Frankly, my dear, I don't give a damn!" 3. "Get busy livin' or get busy dyin'. (That's goddamn right.)" 4. "Hasta la vista, baby." 5. "(But you don't understand, Osgood. Uh, I'm a man.) Well, nobody's perfect!" 6. "Dave, this conversation can serve no purpose anymore. Goodbye." 8. "I've seen things you people wouldn't believe. Attack ships on fire off the shoulder of Orion. I watched C-beams glitter in the dark near the Tanhauser gate. All those moments will be lost in time like tears in rain. Time to die." 9. "Made it, Ma! Top of the world!"